Looking for a studio or 1 bedroom apartment to rent in San Antonio, TX? 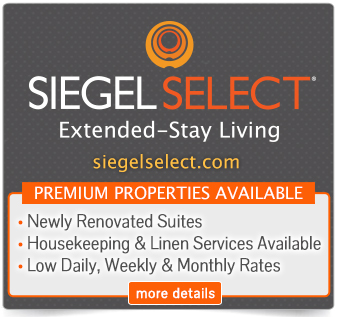 Siegel Suites specializes in low cost apartment rentals! We offer fully furnished studios and one bedrooms in the beautiful city of San Antonio. Close to Downtown Dallas and Fair Park, rents are surprisingly cheap for all you get, including extras like free cable TV, free utilities, and more. And we make it easy to rent Dallas apartments with no long term lease, no long-term commitments, and bad credit ok. Best of all you get to join our free Siegel Rewards® program, where you get free stuff just for paying your rent in San Antonio. So, call us at 1-888-328-0192 to rent apartments in San Antonio with Siegel Suites today!